Chief Clive Weighill is defending the practice. 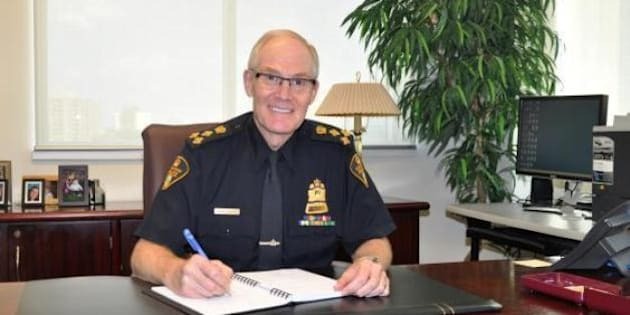 SASKATOON — RCMP Commission Bob Paulson has admitted there are racist officers on the force, but Saskatoon's police chief says he doesn't believe racist views are being translated through the work his officers do. Chief Clive Weighill's comment came Thursday as the city's board of police commissioners considered a report on the practice of street checks, where officers stop and question people out of a "reasonable suspicion'' of criminal activity. Weighill defended the practice but a small group of protesters attended the meeting and stood and turned their backs when the matter was being discussed as a sign of their opposition. When they refused to sit, they were asked to leave. Outside the meeting, the protesters said the street checks are disproportionately used on aboriginals, people of colour and poor people. Earlier this week, Paulson admitted to a meeting of chiefs of the Assembly of First Nations in Gatineau, Que., that there are racists on his police force, adding he doesn't want them there and urging delegates to report any abuses. Weighill said some of the proposed rules in Ontario aren't practical, including one that would force officers to tell people being questioned that they have the right to walk away. He insisted his officers don't target certain ethnic groups when stopping people on the street, but some of the protesters said that's not the case. Eileen Bear said she was recently on her way to a knitting class when a police officer pulled over and started questioning her. He asked her what her name was and although she at first tried to assert her rights she said she caved when a second officer got out of the vehicle. Bear said she was then asked to help identify people on a list of names, but she refused and walked away. "Carding disproportionately targets indigenous people and peoples of colour as well as poor white people,'' said protester Kota Kimura, who helps organize a group opposed to police violence. He said he believes officers tend to act off society's prejudices. The street check report said the force in Saskatoon will put together a policy once the work of the provincial police commission and the Saskatchewan Association of Chiefs of Police is done. But Weighill said given the fact that work has just begun, it could be some time before a policy is put in place.